Tom Seaver’s June 15, 1977, exile to Cincinnati represented the apex (or nadir) of the dismantling of the great and beloved Mets teams of 1969 and 1973. Cleon Jones, Tommie Agee, Ron Swoboda, Nolan Ryan, Rusty Staub, and Tug McGraw were already gone (though Le Grande Orange would return). Jerry Koosman, Ed Kranepool, Jerry Grote, Jon Matlack, John Milner, Bud Harrelson, and Felix Millan would soon follow. Millan’s exodus was the farthest and most physically painful. Following the second baseman’s on-the-field scuffle with Pittsburgh catcher Ed Ott on August 12, 1977—leaving him with a broken collarbone, his final appearance in a Mets uniform—Felix signed with Japan Central League’s Yokohama Taiyo Whales in 1978. “The Cat” would win a Japanese batting title in 1979. In their place came a group that more often than not played as if they’d rather be somewhere else. First baseman Willie Montanez was acquired in a four-team deal that sent Milner and Matlack packing (“Am I still invited to the [Mets] Christmas party?” the left-handed pitched inquired after being dealt to Texas) in December 1977. Willie seemingly defined the term hot dog. He fielded one-handed and displayed the most unique, and most time-consuming, home-run trot in baseball. But Mets fans didn’t see that trot often enough to justify his flashy style and Willie was soon booed out of New York. Elliot Maddox, their first “big” free-agent signing (a reported $950,000 five-year deal) was in the midst of a lawsuit against New York City after ripping up his knee at Shea as a member of the New York Yankees in 1975 (the suit was thrown out in 1985). “There are some guys who quit. There are some guys here who don’t give a damn, a lot of guys who aren’t trying,” complained the outfielder-third baseman, all the while begging to be traded. Randy Jones, NL Cy Young Award winner with San Diego in 1976, probably didn’t fit Shea any more than Maddox did, posting a 4-14, 6.09 record in two seasons there (1981-82) as a Met. New York took a gamble on the lefthander with circulatory problems and lost. They released Jones with two years remaining on a guaranteed contract. Richie Hebner was a bust at third base in 1979 who hated crowds and traffic so much that he allegedly visited Manhattan only once as a Met. Not surprisingly, Hebner worked as a gravedigger in the off-season. Joel Youngblood was a malcontent utility man who spent six years in Flushing, grousing that he should be in the starting lineup for most of that time (but refused a starting assignment at third base). Upon his trade to Montreal in 1982, Youngblood would hold the unusual distinction of playing for two different major-league clubs in two different cities (and knocking base hits for both) on the same day. Even manager George Bamberger was a reluctant Met, only accepting the job as a favor to Frank Cashen. Following a miserable 1982 season, Bamberger nevertheless elected to sign on for one more year. But after a 6-11 April, the Mets manager began seriously entertaining thoughts of resigning. He made it official on June 3. “I probably suffered enough,” he said. Individual honors were few during those years. 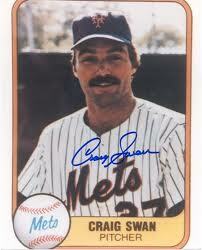 Pitcher Craig Swan backed into a NL ERA title in 1978. Country-and western singing second baseman, Doug Flynn—a Midnight Massacre acquisition—was awarded a Gold Glove in 1980. Dave Kingman’s 37 home runs topped the Senior Circuit in 1982—his 99 RBI ranked second in franchise history—but Kong also struck out a league-leading 156 times while batting .205, and failed to be the drawing card management expected. Lenny Randle was arguably the most popular Met in following the Midnight Massacre in 1977. Playing a solid third base for rookie manager Torre, Randle batted .304 with 33 stolen bases. He made headlines as the player at bat when the power went out in the New York metropolitan area one hot July night. “I thought God had come to get me. I thought it was the end,” he later explained. But during the off-season, Lenny decided he was unhappy with his contract and held an attention-grabbing, fruitless twenty-four-hour holdout. He reported to camp on time, but started the season in a 1-for-25 slump and was benched in favor of Maddox. Randle was released the following spring. Steve Henderson, the blue-chip prospect acquired in the Seaver deal provided some initial thrills. “You’re going to love this kid,” promised Cincinnati skipper, and future Hall of Famer, Sparky Anderson. “He’s going to be a dandy,” agreed Torre. Stevie Wonder’s first four big-league home runs, all hit during his first month with New York, either tied or won ball games for the Amazin’s (the fourth hit in the presence of Duke Snider, Joe DiMaggio, Willie Mays, and Mickey Mantle, in town for Old-Timers’ Day at Shea). The fifth was a grand slam. Henderson ended his rookie season leading the Mets in runs scored, runs batted in, and tied in home runs despite only 350 at-bats. But then came a sophomore slump in 1978, starting with an 0-for-25 streak in late April. The power diminished and the injuries began. A worrier to begin with, Henderson began to press at the plate and by 1980 became an undependable batter in the clutch. Frank Cashen dealt the outfielder and $100,000 to Chicago in February 1981 to bring Dave Kingman back to Shea. During this dismal era, the most familiar Mets were probably Lee Mazzilli, John Stearns, and manager Joe Torre. Mazzilli, a Brooklyn born-and-bred matinee idol, was rushed up to the big leagues at twenty-one in 1976. Too much was expected of him; particularly after belting a home run in his second major league at bat. Maz, who took a screen test for Martin Scorsese (though not much came out of it), eventually lost his center field job to Mookie Wilson in 1981. Moving over to left, suffered through his worst season and became the focus of Shea boo-birds, tired of waiting for Maz to reach his promised potential. With the acquisition of George Foster, Lee became the fourth outfielder, and expendable. He was dealt to Texas for Ron Darling and Walt Terrell, many at the time criticizing the deal. “I never thought I would go for two minor-leaguers,” Mazzilli moaned. Stearns was an offensive-minded catcher who did the majority of work behind the plate during the Dark Years until an injury to his right elbow shortened his career. Nicknamed “Dude,” the intense Stearns was a baseball player with a football mentality (he played defensive back at the University of Colorado), thinking nothing of tackling an opposing pitcher (whether or not he was in the lineup), mascot, or fan who leaped out on to the field. A bulldog, not afraid to speak his mind, Stearns caught five complete games in a 72-hour period in 1982. Of course, the Mets lost all five. Thirty-six-year-old Torre was named manager of the 15-30 New York Mets on May 31, 1977. “‘This is the start of another outstanding career,” Maury Allen of the New York Post, accurately predicted. Poised to lose his best pitcher and home run hitter within weeks of assuming managerial reins, Joe could only say, “I’m here to manage a baseball team on the field with whatever players they give me.” Torre immediately proved to be a player’s manager (though Stearns complained he wasn’t tough enough), adept with the media. He kept the club loose through the toppling of Grant regime and incompetence of de Roulet. Once Seaver left, the ace of the pitching staff became 34-year-old Jerry Koosman. The southpaw asked for, and received, the starting assignment against his former teammate at Shea on August 21, 1977. Working on three days’ rest, Koos battled Seaver hard, trailing 2-1 going into the eighth inning. But a pair of Mets errors helped allow three more Cincinnati runs. “He [Seaver] had more fans in the stands than we did,” Harrelson observed of the 46,265 on hand that Sunday afternoon. Koosman lost twenty games in 1977 (his post-Seaver record being 8-26). Loss number twenty came exactly one month after his August defeat to Tom Terrific, a 4-0 drubbing by Pittsburgh. With that, New York clinched its first basement finish since 1967. A crowd of just over five thousand looked on impassively. “You’ve got to have some sort of talent to lose twenty games,” the left-hander half-joked after the game. Koosman vowed he would win twenty games again, and he did. But it was for Minnesota in 1979. The Koosman deal left Craig Swan and Pat Zachry to battle it out for ace of the staff. “Schwannie,” as Bamberger liked to call him, signed a five-year, three-million dollar contract with New York in 1980, the first big signing by the Doubleday people. In return, the Mets got a total of nineteen wins from Swan: a torn rotator cuff and incessant bouts of gastroenteritis sabotaging his career. The hard-throwing righty was best known for being hit square in the back by a Ron Hodges peg to second base, breaking a rib, and for picking a fight with six-foot-seven-inch, 255-pound Frank Howard, then a Mets coach. Onlookers later noted that Swan had to be either the dumbest, or most inebriated, man in history to become involved in a scrap with Howard. Zachry came from Cincinnati in the Seaver deal coming off a hernia operation, a bad elbow which turned out to be chronic, and a lingering sense of self-doubt. “Look, I had to face it,” confessed the high-strung hurler, “The fans lost Tom Seaver and got Pat Zachry.” A year after the trade, Zachry suffered a hairline fracture in his left foot after angrily kicking a concrete dugout step following his seventh inning exodus from a game against his old teammates. Three batters prior to his dismissal, Pat surrendered a single to Pete Rose, allowing Charlie Hustle to tie the modern NL hit-streak record of 37. That fit of pique cost the lanky pitcher the 1978 season’s final ten weeks. Zachry, who many said featured the best change-up in the NL, was in and out of the New York rotation for the next four seasons. His return to the mound on May 5, 1980, provided Mets fans with one of the more emotional and inspirational moments of the era. But after all was said and done, for dealing The Franchise, the Mets got a 41-46 record out of Zachry. By 1979, the Mets pitching and financial situation had grown so dire that Joe Torre was forced to bring three rookies up north from spring training: Jesse Orosco, Neil Allen, and Mike Scott. None was an immediate success. Scott, who was considered to have the best stuff on the staff, was in and out of the rotation, compiling a 14-27, 6.64 record before being dealt to Houston in December 1982 where he learned the split-fingered fastball from original Met, Roger Craig. The left-handed Orosco, acquired as almost an afterthought from Minnesota in the Koosman deal, surprised everyone by making the club at the age of 20. Ironically, in his major-league debut, Orosco induced Bill Buckner of the Cubs to fly out for the final out of a 10-6 Mets opening-day victory. By 1982, Jesse was a mainstay in the New York bullpen. On May 31, Neil Allen was 1-5, 7.06, and ticketed for the minors when he suffered a rib injury and was placed on the 21-day disabled list. Since he could not be sent to the minors while on the DL, Allen had to sit on the Mets bench and observe. When he was ready to pitch again, Mets closer Lockwood was injured and so Torre, with few alternatives, gave Allen a shot in the bullpen. He responded with eight saves, becoming Torre’s most reliable reliever. Allen remained so until the middle of 1982. That June, he was sidelined for nearly two weeks with a colon infection. Asked to warm up on August 8, in Pittsburgh, Allen “…couldn’t throw the ball to the catcher. Not even underhand.” A strained tendon in the right elbow was diagnosed, rest the recommended cure. Neil persuaded everyone he was back in form during spring training 1983. But then the wheels began to come off. He blew a couple of saves in April. Then, a magazine article quoted Allen criticizing several of his teammates including Tom Seaver, who had returned to the Amazin’s that year. Neil was also involved in a late-night brawl outside a St. Louis-area disco, and there were reports of problems with his marriage. In early May, the reliever informed Mets management he had a drinking problem and was seeking help. He was diagnosed to the contrary. Allen’s “drinking problem” became a running joke in New York for several days. Seaver was particularly critical: “Problem, my foot,” exploded The Franchise. “He’s got no problem. He’s using it as a crutch because he won’t face the real problem. He’s got no more problems than anyone else in this room.” “Neil is 25 going on 12,” an unnamed player chimed in. This entry was posted in Baseball, Right Off the Bat Website, Yankees and tagged Bill Buckner, Bud Harrelson, Busch Stadium, Chicago Cubs, Cleon Jones, Craig Swan, Cy Young Award, Dave Kingman, Dock Ellis, Doug Sisk, Duke Snider, Ed Kranepool, Ed Ott, Elliott Maddox, Felix Millan, Frank Cashen, Frank Howard, George Bamberger, George Foster, George Steinbrenner, Japan Central League, Jerry Grote, Jerry Koosman, Jesse Orosco, Joe DiMaggio, Joe Torre, Joel Youngblood, John Milner, John Stearns, Jon Matlack, Lee Mazzilli, Lenny Randle, M. Donald Grant, Mickey Mantle, Mike Scott, Minnesota Twins, Mookie Wilson, National Baseball Hall of Fame, National League, Neil Allen, Nelson Doubleday Jr., New York Mets, Nolan Ryan, Pat Zachry, Pete Rose, Pittsburgh Pirates, Randy Jones, Richie Hebner, Roger Craig, Ron Darling, Ron Hodges, Ron Swoboda, Rusty Staub, Shea Stadium, Sparky Anderson, Steve Henderson, Thurman Munson, Tom Seaver, Tommie Agee, Tug McGraw, Walt Terrell, Willie Mays, Willie Montanez, Yokohama Taiyo Whales. Bookmark the permalink.